Saint Thomas Aquinas, an Italian philosopher and Dominican friar who lived during the thirteenth century, was the greatest of the medieval theologians. His writings harmonized faith and reason, which resulted in a Christian form of rationalism. 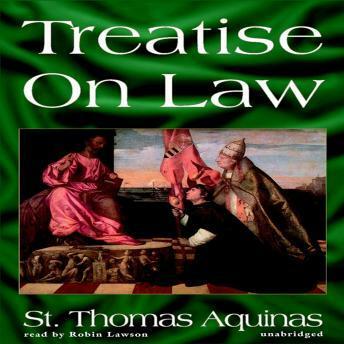 This treatise comprises questions 90-97 of the Summa Theologica, in which St. Thomas presents a philosophical analysis of the nature and structure of law. Believing that law achieves its results by imposing moral obligations rather than outright force on those subject to it, he proceeds to explore vital questions about the essence of law, kinds of law, effects of law, eternal law, natural law, human law, and changes in law.